Fink Family: Weekend Whirlwind, Terrific Tuesday and a Wonderful Wednesday! Weekend Whirlwind, Terrific Tuesday and a Wonderful Wednesday! Sorry for the delay in updates. This weekend was a complete whirlwind of activity. I had a good appointment on Friday and my blood pressure started to go down slowly. Saturday we installed the car seat which was at the top of the to do list! As I pulled into the parking lot at the hospital on Saturday the NICU nurse for Ava that day called and asked that I bring the car seat up. This was kind of out of nowhere and since I just happen to have it in the car I brought it up with me to my visit. They had wanted the car seat on hand so that Ava could test possibly for her car seat to see if she could breathe and such while in it. This is a sign that they are close to discussing letting her leave. As I brought it up I had very mixed emotions but moved ahead carefully. The nurse explained they would test her Saturday or possibly Sunday. As I sat and fed Ava on Saturday I felt she looked yellow again. The doctor on call was doing rounds while I was there and he also agreed and put in a request for blood work. 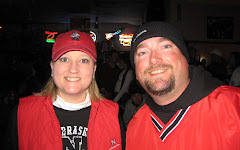 I left shortly after 2 to watch the Huskers (as pathetic as the game was) and when we returned that night she was back under the lights. Again, we had been warned of the 2 steps forward and 2 steps back. I was just glad to see she was getting the medical attention she needed. She remained on the lights on Sunday so we kept our cuddle time with her limited so that she can improve. Monday I had my usual appointment and my blood pressure was back up. I experienced the bad headaches, dizziness, feeling sick to my stomach so my time with her was short on Monday but still good. Ava had passed her car seat test and also her hearing test. The nurses told us that she could possibly go home within the week. They would also do a scan/sleep test on her Monday night to establish her breathing and heart rate patterns and see if she needs to have a monitor when she comes home. Again, we were still unsure when her homecoming would be! Tuesday morning around 11am the nurse called to let us know that Ava would need to have a monitor because her results were borderline. They informed me that training would be at 1:30p for about an hour and a half and then we were to pack an overnight bag and we would be "Sleeping In" at the hospital that night. Well Troy and I cleared the schedules, got our bag pack and headed to the hospital for the activities. We got through the training and were relieved it was very simple to use but still overwhelming. We are so thankful that Cathie the instructor is just AWESOME and somebody we actually know through her family so we felt we could ask all the questions we wanted. We left to grab some dinner, run an errand and return to "Sleep In". Let me tell you that it was quite the experience. I was nervous the entire time the alarm on the monitor would go off (which is SOOO LOUD) but it seemed that was the least of our worries as we were kicked out of our room at 3am to accomodate a recovering mommy who had just given birth. We were relocated to the NICU to the room that some mommies use for pumping and such that was the size of a large closet with a small pull out chair for 2. Despite the movement, lack of sleep and excitement we made it through the night. Wednesday is just wonderful! We were packed up, discharged and on our way to the clinic at 8:30 for her 1st RSV shot. We arrived home shortly after 9am as a family of 3! We are still adjusting but it feels good. We just have to hope that Ava adapts well and continues to eat as she needs to and if not we will go from there and figure it out! All in all today is a wonderful day! Because Ava is a preemie we have lots of rules and such to follow. The first is that she is to stay out of public places and such for at least the next 4 weeks. We are also to limit visitors daily (especially children for a couple of weeks) and to keep anyone away that is sick, has a sick child or has been sick within the last week. All I can say is that Ava is so anxious to meet everyone but it will take a little time and patience. We are so excited for today and again cannot thank everyone enough for their support, love, thoughts and prayers. We are looking forward to this next chapter and getting her to know all of you! Stay tuned for more pictures and updates! CONGRATULATIONS! We are thrilled that Ava is home and that you are all doing well. It must be a very exciting time. I bet having her home will help your blood pressure. We continue to pray and send good thoughts. Such Awesome News! Happy family time! Great to hear things are going well! !